Turmeric has been cultivated for over 5,000 years now, mostly on the Indian subcontinent, and it has long been associated with the divine for its many practical uses. Read on to learn all about growing turmeric at home following these easy guidelines. Turmeric is a perennial herb of the ginger family with large, oblong leaves, light yellow flowers, and an underground rhizome. Planted year-round in tropical regions and during the springtime in temperate zones, turmeric can be easily cultivated at home taking into account the following growing guidelines. Because it requires temperatures from 70 - 85°F (21 - 30°C), turmeric soil should be prepared in warm weather away from excessive shade. Although many different soil types are permissible, turmeric grows best in well-drained, sandy soil that is rich in organic matter. It is also preferable to maintain a pH level of 6.0 - 6.5. For best results, dampen the soil prior to planting. Unlike many other food crops, which use seedlings, propagation of the turmeric plant occurs via root cuttings. It is therefore important to select quality, disease-free planting material that has begun to produce small buds. These dried turmeric fingers can be store-bought or saved from previous harvests. Plant them about 15 - 20 inches (40 - 50 cm) apart in two-inch deep (5 cm) wells. Before covering them with a light layer of soil, make sure that all buds are facing upwards so that the plant may grow towards the surface. In cold weather areas where temperatures drop below 50°F (10°C), it may be preferable to grow turmeric plants indoors. If such is the case, plant two or three turmeric fingers about an inch or two (2.5 - 5.0 cm) down in a spacious, well-drained planting pot. Turmeric is a tropical plant that needs both warmth and light to survive; however, over-watering will prove detrimental to the starter plants. Instead, use a spray bottle to lightly dampen the soil about twice weekly, and carefully transfer the turmeric roots and plant parts to a bigger container as needed. Because indoor potting produces a very low yield, it is highly recommended to transplant turmeric to a garden or field whenever possible. The best fertilizers for turmeric are organic, like garden compost. Rich in calcium and magnesium, fertilizer should be applied in such a way that its nutrients can be absorbed by the roots without coming into direct contact with leaves and stems. It is generally mixed in with the soil before watering and mulching. In areas with adequate rainfall, turmeric plants require infrequent watering. In fact, some gardeners suggest forgoing watering until the first signs of shoots become visible near the surface. This is because, while turmeric plants enjoy moist soil, deep over-watering has been implicated in a number of turmeric plant diseases. To preserve the integrity of turmeric, it is necessary to protect it from weeds and invasive plant species. It is recommended to do the weeding by hand at least one and three months post-planting, but some commercial weed treatments are also acceptable. Afterwards, mulch the surrounding turmeric plant beds to preserve moisture and keep future weeds at bay. Widely prevalent in many of the areas in which the plant is grown, the shoot borer (Conogethes punctiferalis) is considered the most serious pest of turmeric. An infestation usually occurs when the larvae begin feeding on the newly-developed shoots of the turmeric plant, drying it out and turning it yellow. Boreholes in the stem or a wilting central shoot will be visible. In severe cases, larvae have also been known to bore into the rhizome near the base of the shoot. Some other turmeric pests include white grubs and leaf rollers. Infestations can be effectively managed with the help of insecticides like malathion, or through the use of some organic herbal preparations made from the leaves of the aloe vera, tobacco, neem, garlic, or chili plants. 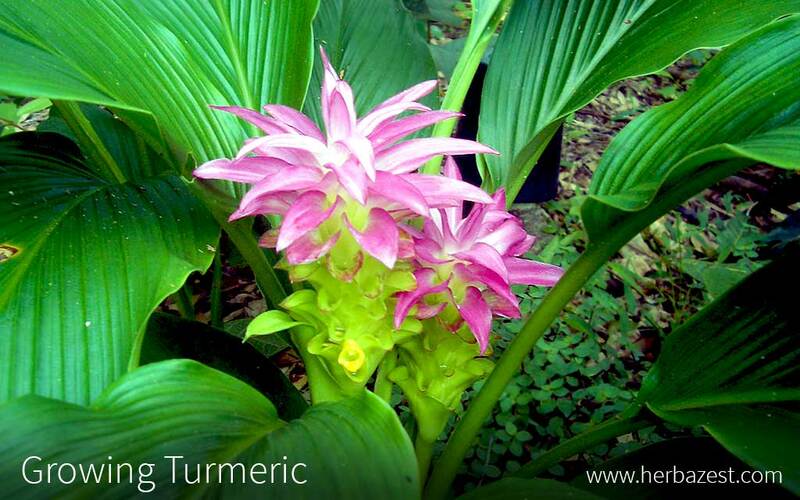 Many of the illnesses affecting the turmeric plant are rooted in poor gardening conditions. For starters, stagnant water is not well-tolerated by the turmeric plant. Vulnerable young shoots become waterlogged, eventually causing rhizome rot and yellowing of the tips of leaves. Treating turmeric rhizomes with an antifungal agent prior to planting may prove effective in the prevention of disease. As is the case with some other turmeric illnesses, high moisture and hot temperatures can lead to leaf blotch, an illness where turmeric leaves develop irregular brown spots. Meanwhile, on the other end of the spectrum, low temperatures can permanently stagnate turmeric plant growth. In some areas, rodents and other animals may pose a threat to the turmeric crop by burrowing underground holes near where it is planted or by trampling over the plant's aerial parts. With proper care and favorable climatic conditions, turmeric rhizomes usually mature about eight to ten months after planting. Above ground, the entire plant will start to droop, its leaves slowly losing their color. Harvesting involves digging up the turmeric rhizome from the soil and gently detaching it from its roots. For this reason, it is widely suggested that pruning of the turmeric plant is an unnecessary step, since leaves tend to fall off on their own. However, in the case of diseased or dying leaves, pruning may be appropriate. After harvesting, turmeric rhizomes are thoroughly washed and boiled in hot water for at least an hour to help brighten their color and release some of the oils responsible for their deep aroma. Using high heat or direct sunlight, the cooked rhizomes are then dried and polished to improve their outer appearance. They are sold on the market this way or ground into the well-known turmeric spice, used for curries and other seasonings. Under proper growing conditions, turmeric can be easily and inexpensively cultivated. Although its commercial importance is largely predicated on the use of its rhizome as a food seasoning, the turmeric plant also produces beautiful, aromatic flowers and large, showy leaves, sometimes used as a culinary flavoring and ornamental food garnish. No matter its intended use, turmeric is a truly unique herb worthy of a place in any home garden.